Prime Minister Oli is looking more and more like a man just trying to buy time for his political survival. He came to power with an ambitious game plan of reviving the economy, putting relations with neighbours on an even keel, and resolving the Madhes crisis. Eight months into his term, he seems to have settled for just one objective: not being overthrown. After having stemmed a coup attempt last month by his own coalition comrade Pushpa Kamal Dahal and the opposition Nepali Congress, he is going all out to prolong his tenure in office so he can go down in history as being the leader who stood up to India. He is also mindful that he is living on borrowed time in terms of his personal health. With nothing left to lose, Oli is stoking New Delhi’s paranoia about China, knowing fully well how Indians get rattled even as talking heads work themselves into a frenzy on television over ‘Chinese inroads’. Leaders can fool some of the people some of the time, but they cannot fool all of them all the time. Oli is playing the nationalism card to the hilt, but that stratagem has a limited shelf life. The Chinese will go only go so far in provoking the Indians, as we saw during the Blockade. And for Nepal there is no option but to come to terms with our southern neighbour’s insecurities. Oli is also walking a tight rope between rival power centres in New Delhi — balancing and taking advantage of conflicting signals coming from BJP-RSS politicians and the intelligence bureaucracy over Nepal policy. Ever since Prithvi Narayan Shah compared Nepal to a yam between two boulders, the conventional wisdom has been that we are squeezed between the two giants, to the north and south. We may have to modify the analogy: today Nepal is instead trapped between the interests of the Hindu-right and the rest in New Delhi. There used to be a time when India had a ‘twin pillar’ strategy to simultaneously back the monarchy and democracy in Nepal. It would have worked to ensure stability, but somewhere along the way that policy lost currency. Republicanism, secularism and federalism were somehow slipped into the new constitution. After the rise of the BJP, we detect moves to try to dismantle the three -isms: roll back secularism, rework federalism and possibly even restore the monarchy. The ‘twin pillar’ policy has been replaced with ‘twin contradictions’ being played out between proxies on the ground in Nepal. One cannot analyse the Machiavellian manoeuvrings in Kathmandu without factoring in that gorilla in the room. Even so, there is a tendency in Kathmandu to read too much into Indian micromanagement of our polity. Certain things are for us to resolve, and in this we find the Oli administration deliberately lethargic and uncaring when it comes to addressing Madhesi demands on amendments to the constitution and moving ahead. This obduracy is prolonging instability, escalating the Indo-Nepal Cold War with great opportunity cost to this stalemate. Half the problem faced by the Madhesis is how they are perceived. That the people of the plains are treated as second-class citizens, looked down upon, discriminated against and called ‘Indians’ by the hill folk. Successive governments in Kathmandu have not done much to redress these notions, and the current rulers are no different. The Indian Blockade has, in fact, further embedded the mistrust. The other half consists of demands for changes in the constitution so there is demographic proportionality in representation of Madhesis in the Upper House, for boundaries of future provinces, and for the removal of discriminatory provisions in citizenship. The clause about citizenship of children of Nepali mothers is directly related to Kathmandu’s irrational phobia of cross-border marriages and the spectre of 'Indians' occupying positions of political power. Given the growing gap between hills and plains and the radicalisation of Madhesi youth, it is the responsibility of the national government in Kathmandu to be proactive in defusing the crisis — first with confidence-building measures, and then subsequently engaging in meaningful attempts to address Madhesi demands while they are still do-able. This is now a nation divided, and delay tactics can no longer work. The longer the stalemate drags on, the higher the chances of extremists and the religious right setting the agenda. 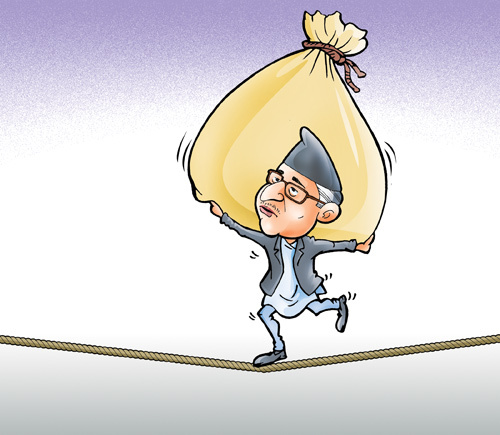 Prime Minister Oli is dragging his feet, using speculation about regime change as a distraction so he does not have to take the bull by the horns. He would be well-advised not to tarry, lest he suddenly find that his time has run out.